As part of my return to my artistic roots, I’ve wanted to go back to the basics and learn skills I never fully acquired or relearn what I might have forgotten. The technical aspects of drawing have never been my strong suit, and I think part of the reason is that the subjects, being largely human-made and geometric, never inspired me. I’ve always loved organic shapes and lines–the forms of fruit, vegetables, leaves, flowers, and the lines of bare trees in winter. So when I saw a class offered in botanical illustration, it seemed like it would be perfect for my needs and interests. The first class in a series, which is almost finished, has been as basic as you can get: gray scales, atmospheric perspective, texture, shading basic shapes, and shadows. 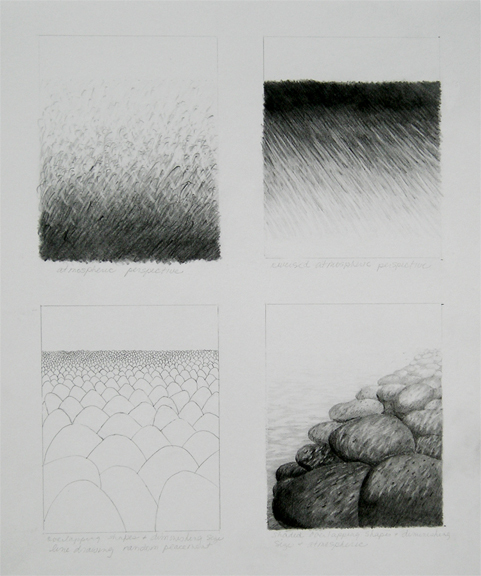 Here’s one page of atmospheric perspective, using texture fading to a horizon line, overlapping shapes diminishing in size, and combining these for the last in the lower right quadrant. The work is challenging, sometimes tedious, and I am thoroughly enjoying it! I am looking forward to the next class when we will actually get into drawing plant forms and using color! I really want to get back to some of my other projects, such as the deep mapping and a half-finished Japanese woodblock print, but this class has consumed me over the last month. 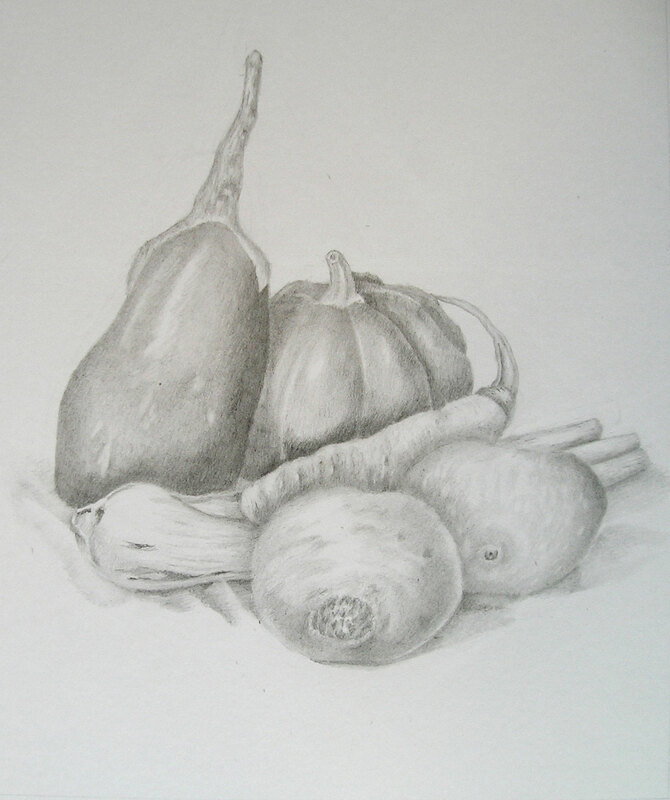 Our last project in the course was a still life. We didn’t have time to complete it in class. I’ve finally finished it (below). I can now see how all the prior exercises in the course (gray scales, texture, and shading/light in particular) are essential to creating a realistic end result. Not perfect, but I am pleased with this!